Do You Know Benefits of Almond Milk? Remember when you were little, your granny or mom would feed you soaked almonds or almond milk while going to school. The sole reason behind that is “Almonds are extremely good for your body”. Almonds are stuffed with nutrients. It helps in improving vision, weight loss, strengthening your bones, prevents heart diseasesetc etc. You name it! Now you must have heard of Soy Milk replacing cow’s Milk. But did you know Almond Milk is an even better option for lactose intolerant people or those who steer away from dairy because of its calorie content. The calorie content of Almond Milk is almost half than Cow’s milk or Soy Milk. Although Almond Milk contains lesser calcium than Cow’s milk, it’s still higher than Soy Milk. It’s loaded with unsaturated fats and has 0 grams of saturated fats, which is extremely beneficial in preventing Heart diseases. Also it contains omega 3 and omega 6 fatty acids. Pure Almond Milk or Homemade Almond Milk doesn’t contain sugar. Although if you’re buying flavored Milk, it might have sugar in it. So for diabetic people, homemade Almond Milk can be consumed without worrying about your blood sugar levels. Almond Milk is low in calories, carbs and has no saturated fats. And is that’s not enough, it’s high in proteins, fibers, energy and lipids. It also contains tons of vitamins such as calcium, zinc, magnesium, phosphorus, sodium, iron, selenium and potassium. Other than that, it has Vitamin C, E, B6, niacin, riboflavin, thiamine and folate. As mentioned above, one cup of Almond milk contains only 60-70 calories as compared to whole milk which has 146 calories. You can include Almond Milkin your breakfast if you’re avoiding dairy, as it has a minimal amount of calories. And as it contains proteins, it’ll keep you energized throughout the day. Like mentioned above, it has none of the saturated fats and cholesterol. Also it is low in sodium and packed with goodness. The presence of healthy fats such as omega 3 and omega 6 fatty acids prevent high blood pressure and heart diseases. It contains essential nutrients such as calcium and Vitamin D which improves your immune system. These nutrients also reduce the risk for osteoporosis and arthritis. And it is no secret that calcium provides healthy and strong bones & teeth. The Vitamin E present in Almond milk has anti-oxidant properties. And those anti-oxidant properties help your skin against sun damage from UVA and UVB rays. Did you know that one serving of Almond Milk contains 50% of daily recommended intake of Vitamin E? Well now you do. As pure Almond milk is low in carbs, it doesn’t affect your blood sugar level which keeps the risk of diabetes at bay. And to top it off, because of its low glycemic index, the carbs will be used by your body as energy. One cup of Almond Milk contains 1 gram of protein, which contains plenty of Vitamin B such as riboflavin and iron. And both of these vitamins help speed up your body’s healing process as well as grow muscles. The fiber content of the Almond milk ensures healthy digestion. Almond milk is a great substitute for dairy as it contains also contains proteins, fibers and other vitamins. And it contains lesser calories than whole milk. So for people who are lactose intolerant, Almond Milk can cover for the entire protein and fiber intake. As mentioned above, Almond Milk contains plenty of Vitamin A. You want to know how much is that? Hear me out; one serving of Almond Milk contains the daily recommended intake of Vitamin A. And Vitamin Aallows your eyes to adjust to the lighting changes. It also keeps your skin feeling soft and healthy. 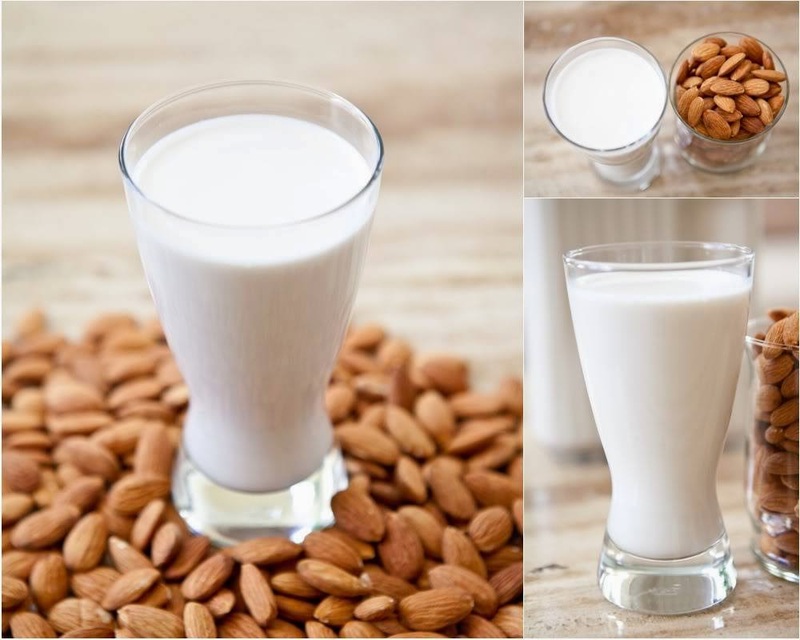 While preparing the Almond Milk, the skin of the Almonds is left on while blending and the skin is rich in Flavonoids. Flavonoids are good for cardiovascular health which means it keeps heart diseases at bay. You can always buy it but homemade is always better than store bought. It’s easy to make and fresh. The best part is that it’s free from all those preservatives. So, here’s a quick recipe to make your own Almond Milk. Soak the almonds overnight in a large bowl filled with water. Drain and rinse the almonds the next day. Add the almonds in a high speed blender. Now depending upon the consistency of the milk, add water. If you want your Almond Milk to be creamy, add two cups of water. Blend that for 2 minutes under high. Now pour the blended mixture in a bowl covered with cheesecloth to strain the bits and pieces. You now have pure Almond Milk. You can store it in your refrigerator for 4 days. Now this was your plain Almond Milk. For some flavoring, you can try chocolate, saffron or dates. For Chocolate Almond Milk, add cocoa powder and sweetening (honey, maple syrup). Soak a few strands of saffron in cold milk and add it in the mixture along with some honey. You’ll get Saffron flavored Almond Milk. While blending the Almonds, add in about 8 dates seeded. This will add an extra flavor to your Almond Milk. Tip- Leave on the skin of Almonds while blending as the peel contains many nutrients as well. So, like I’ve mentioned a million times now that Almond Milk is not only a great substitute for Cow’s milk, it also gives a healthy start to the day. It contains almost the same amount of nutrients as milk, and the calorie content is also lower than whole milk. So go ahead and give this a try.